“Great presentation, but a little bit preaching to the choir,” said the woman sitting behind me at Sunday’s general session of the ASLA Annual Meeting in Boston. Indeed, when Dr. Stephen Kellert, the Tweedy Ordway Professor Emeritus of Social Ecology and Senior Research Scholar at the Yale University School of Forestry and Environmental Studies, took the stage to give his talk on biophilic design, he mentioned he felt strange presenting to a room full of landscape architects, as they are on the front line of designing humans’ relationship to nature. 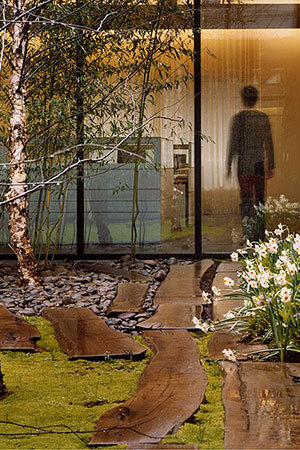 Biophilia is the “inherent human need to affiliate with nature.” This need, while instrumental to our health and physical and mental well-being, is a “weak biological tendency that benefits from and is strengthened by learning.” Biophilic design strengthens and enforces our affiliation with nature, which leads to, simply stated, happier and healthier people. If you read this blog with any regularity, there’s a good chance you’ve come across posts on biophilic design and the importance of nature in people’s everyday lives. You’ve seen posts that outline how nature is fundamentally good for us, providing benefits for our mental and physical well-being. So why do we continuously preach to the choir? Dr. Kellert put it this way: while 99 percent of human evolution happened in the natural world, the modern “natural habitat of people is the built environment.” Consider these facts: 80 percent of the world’s people live in cities. We spend 90 percent of our time indoors. Children today spend just 40 minutes a week outside versus 52 hours a week in front of some sort of electronic media. We continue to talk about because it’s not only critically important to our future, but because it’s not yet standard practice and needs to be. “We’re the only species in the world that needs to prove nature is important.” As he pointed out, it’s strange that the “exploitation of nature,” which accounts for 15 percent of the global economy, is accepted without question, while the aesthetics of the natural world is either seen as a luxury of the wealthy or something that’s really very nice, but not at all important. The truth — a point that cannot be overstated and is also worth repeating — is that if we ignore the human need for contact with nature, one that is deeply rooted in human development, we do so at a risk to our mental and physical well-being. So a deeper understanding of the importance of the aesthetics of nature, and how they can be applied through biophilic design, needs to be explored. The beauty of a place is actually very important. Beauty invites us in, and, through curiosity, which is the first step to engagement, promotes learning. Learning, in turn, enforces our biophilic needs. Beauty of place promotes a sense of stewardship for a natural setting, which leads to more time spent in nature, which in turn promotes our mental and physical well-being. Biophilic design of landscapes and buildings mimics the aesthetic coherence and organizational symmetry of nature through emulation and design. It’s also an ancient practice, some of our most revered buildings and landscapes have an essence of natural settings, but it’s one that has fallen away in recent time with sprawl and auto-centric design. But the negative trends in both human health and unsustainable communities can be reversed. As Dr. Kellert put it, “we designed ourselves into this predicament; we can design ourselves out of it.” At its core, biophilic design is not just a buzz word, it’s simply good design, but one that requires a new design ethic. Until then, he’ll continue to preach. Read Kellert’s most recent book, Birthright: People and Nature in the Modern World. Image credits: (1) ASLA 2006 Professional General Design Honor Award. Small Is Beautiful. Eli Tahari courtyard. 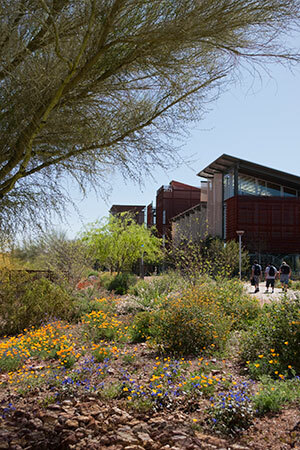 Michael Van Valkenburgh Associates / Elizabeth Felicella (2) ASLA 2012 Professional General Design Honor Award / Arizona State Polytechnic. Ten Eyck Landscape Architecture / Bill Timmerman, (3) ASLA 2013 Professional General Design Honor Award. 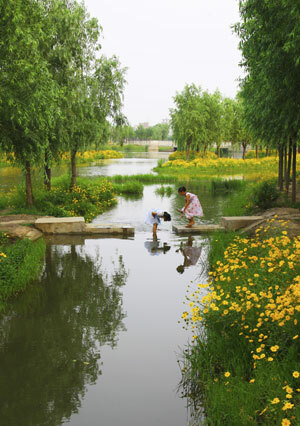 A Mother River Recovered: Qian’an Sanlihe Greenway. Qian’an City, Hebei Province, China. Turenscape / Kongjian Yu, FASLA. A great short piece that hopefully encourages us as designers to focus our creative energies on promoting beautiful and bold designs. Even this notion of losing touch with other humans and, by extension, nature, has been mentioned at tax conferences. When talking about the current state of the economy and which businesses are succeeding and why, what was interesting to hear from my father, an accountant, was that [insert your favorite coffee shop company] has reproduced the “town square” and is not so much selling coffee, but rather a social atmosphere. And isn’t that the truth of what we as designers are trying to harness. The new question is not “how do we get persons to seek out nature?”, but rather ask it differently: since we are seeing that social and environmental connections are being pursued (look at the success of REI, et. al), how do change society’s focus to require these connections in their immediate surroundings?